Still looking for the perfect gift for the crafter who can do it all? Don't despair! It's not too late to pick up a copy of any of these great titles for your resident sewist or quilter. 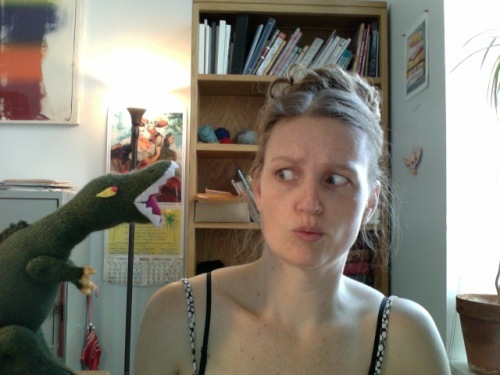 It's awfully exciting to come to work in the morning and find a box on your desk containing a knitted dinosaur. 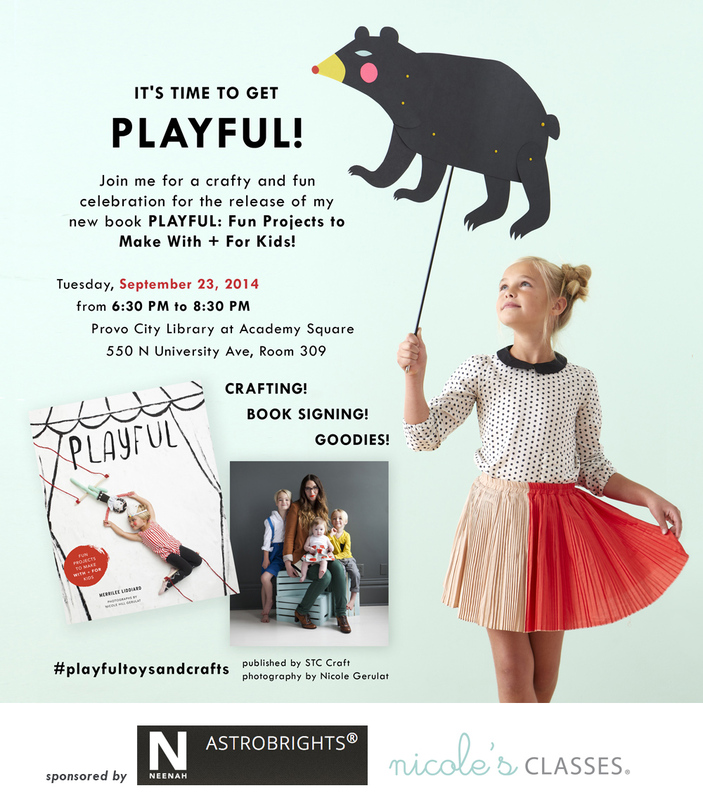 It's even more exciting (and, okay, a little strange) when that happens every day for a week! But alas, there was a reason I came to work each day last week to find a new knitted dinosaur waiting for me: We had hired knitters all over the country to make samples of all shapes and sizes from our new book, Knitted Dinosaurs, for display at Vogue Knitting Live (last week) and for TNNA (this coming weekend). Our favorite part was seeing how different yarn weights can change a dinosaur so much! In the photo above are a Pterodactyl and Stegosaurus (on the right) and a giant T-Rex named Petunia (who has a few miniature Troodons riding on his* back), all of which were made from delicious Blue Sky Alpaca and Spud & Chloe yarns. Petunia was made with Spud & Chloe Outer, a super bulky weight yarn, and came out a whopping 42 inches long and 34 inches around...almost three times bigger than he is when made with a DK-weight yarn! The beautiful thing is that the patterns in the book work no matter what your gauge, so you can make the dinosaurs any size you like. We also loved seeing the way that two different yarns at the same gauge could subtly alter the look of a stuffed dino. The Pterodactyl above was made with Spud & Chloe Sweater yarn, which is a fluffy, cuddly wool blend, while the Pterodactyl below was made with Spud & Chloe Fine Sock yarn, which gives the fabric a tight, sleek look. But best of all was seeing how each individual knitter interpreted the pattern and put her spin on it. Each dinosaur was stuffed to a different degree of firmness or squishiness; some had flirty eyelashes to match their colorful button eyes; and the placement of the legs or arms was just slightly different on each one. It's funny how all of these details gave each dinosaur a distinct character, reflecting the person whose hands had made it. 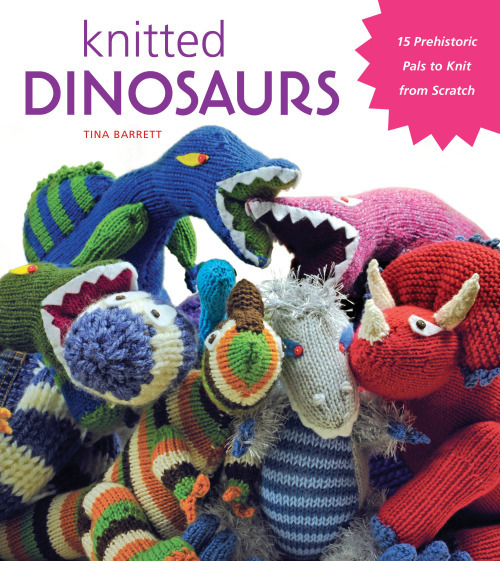 If you'd like to see the knitted dinos in person, be sure to stop by the Unicorn booth at TNNA this weekend. A few of them will be hanging out with the rest of the STC Craft books. And word has it that Petunia and a few of her pals are heading over to Knitty City for the rest of January. So, if you're on the Upper West Side in New York City, go for a visit. Knitty City is walking distance from the American Museum of Natural History, where some other pretty famous dinos reside. *Though it may seem counterintuitve to name a boy dinosaur Petunia, I was told by his maker that yes, he is indeed a boy. This summer, we were thrilled to have some visitors join us at STC Craft headquarters in New York City. Tina Barrett, author of our new book Knitted Dinosaurs, sent five of her favorite prehistoric pals to hang out with us for summer vacation. Truth be told, we had requested the samples for a sales meeting in July, but once we saw how amazing the dinosaurs were in person—just as detailed and nuanced and cuddly and ferocious as they appear in the book—we were reluctant to send them back. What can I say? We were smitten! Knowing that we couldn’t keep them forever, we decided at the very least to take some photos. 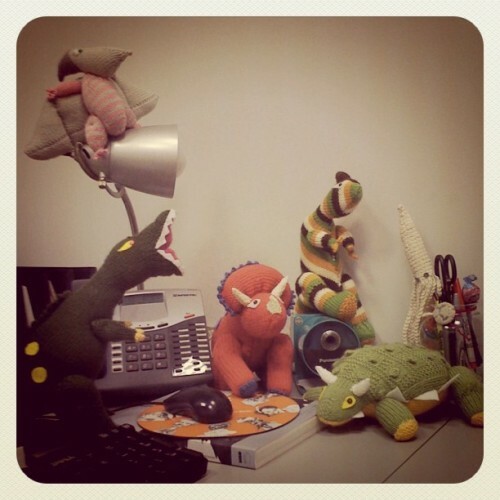 For starters, Ellie arranged them on her desk (above). 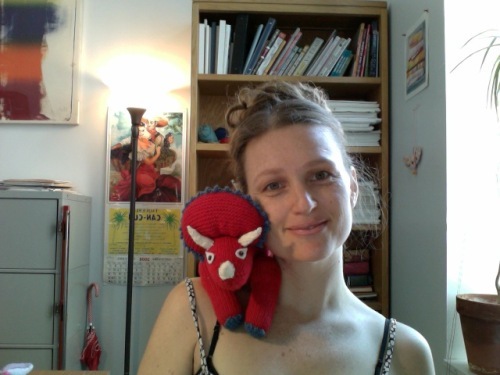 And I couldn’t help but pose with a few, taking photos on my Mac with Photo Booth…after all, it’s one thing to tell your friends that you have a group of knitted dinosaurs on your desk. It’s quite another to send them a photo of a T-Rex attacking you at your desk! And while I love each and every one of them, I do believe that the Triceratops has stolen my heart. Since our dino friends were visiting from the UK, we thought it was only right to take them on a little field trip around the city. Here Parasaurolophus takes in the splendor of the Empire State Building just outside our STC Craft office on 6th Avenue.